During April 2010 a product recall was initiated by the electrical equipment manufacturer, Electrium, relating to the risk of fire associated with certain miniature circuit breakers (MCBs) including Crabtree, Volex and Wylex brands supplied between April 2009 and February 2010, see www.mcbexchange.co.uk/electrium. Whilst some of the affected equipment will have been replaced under the recall, it is likely that much will not, and we are now seeing an increasing number of fires caused by these MCBs. 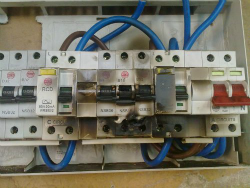 This should, therefore, be considered as a potential cause of any fire at the electrical distribution equipment. 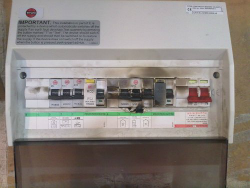 The physical evidence at an incident device, which has caused a fire and has been subject to the recall, is localised melting and erosion between the static and moving contacts within the MCB. 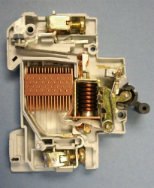 This is characteristic of a resistive heating fault and is most likely due to either poor contact pressure between the contacts or defective/misaligned contact pads.